How Low Is Too Low Even For A Kardashian? 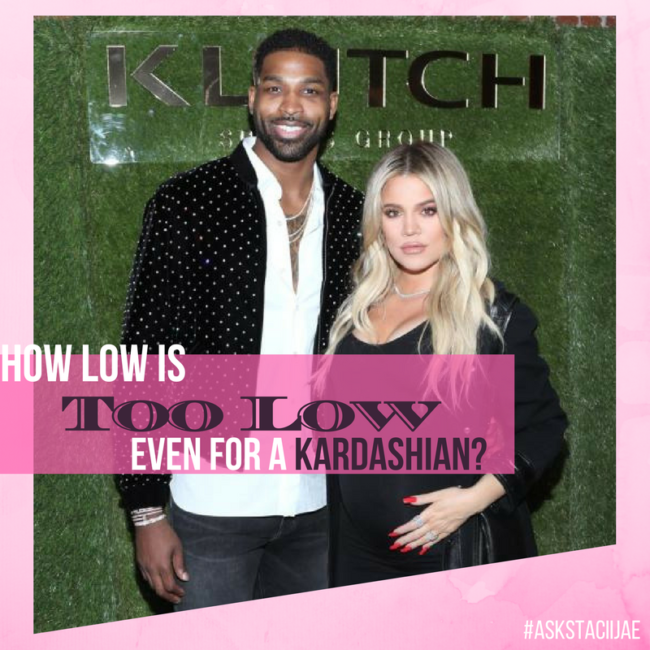 If you haven’t seen the media reports, recently Khloe Kardashian’s boyfriend, NBA player Tristian Thompson was allegedly caught in a cheating scandal. While this situation may not be shocking to most, to make the situation worse, Khloe was pregnant during the time of this scandal. Khloe has since had the baby and Tristan was reportedly present at the hospital for the birth. And good for them for pushing pass the immature decision making of Tristan who was seen making out with several women in a public club, had leaked video footage of him going inside a hotel with a female, and then his text to the female were released by the girl to Media sources around the country (allegedly). Truly insane! Being in a relationship with a high-profile woman, such as Khloe Kardashian, or any Kardashian in this manor, signs any man up to remain in the spotlight and in the lens of any camera to follow their every move. I know that. You know that. And my mind tells me Mama Kris did too. Trust and believe tv is real and the Kardashian ploy has to be kept new and exciting this season. It’s business as usual as far as I am concerned for that klan. The notion that Tristan was not aware of the cameras is probably true. He might not be screwed on as tight as he needs to be and his past choices in relationships probably had Kris’ mind turning from the start. Patience is a virtue for Mama Kris. My guess is that she has known of Tristan’s behavior for much longer than the “public” tapes coming out with Tristan kissing the girl in the club and all the other nonsense that he has been caught doing. My guess was that Kris was just holding onto what she knew for as long as she could. Hoping that Tristan would continue his escapades closer to the baby being delivered. And that his “not so smart” self-did. And now all of the Kardashian beloved audience can stay tuned in this season to see how it all unfolds. For me though… this was so disappointing to find out that Tristan was scallamandering around town stepping out on Khloe. I don’t watch the Kardashian show religiously like some people, but I do watch it sometimes and Khloe is my favorite. I was so happy to see her finally find love. I know you all are saying well, what kinda love did she find when he left his “pregnant” girlfriend for Khloe? Pregnant she was. No doubt. But being in the relationship business, without knowing or having any public “confirmed” information about their relationship, a baby on the way if you look deeper into the relationship can say a lot of things that don’t lend to our assumption that “he left his pregnant girlfriend” for Khloe. The relationship could have been over before the baby or the baby could have been a plan to try to hold on to him…. blah blah blah. Needless to say, I had to bring this “Tristan Khloe Saga” to you ladies to hear your thoughts and you all certainly kept it 100. I always appreciate y’all for that too. You ladies had some fired-up comments to say about this situation. I love it. Here’s a challenging thought that we often look over when it comes to relationships like this. Regardless of how this relationship started between Khloe and Tristian, it would be so unfair to not extend the support and acknowledge the reality that Khloe deserves a healthy relationship with a man, as we all do. But why are we in such a big rush? From what I have read, Tristan and Khloe started dating September 2016 and by January 2017 she told James Corden in an interview that her and Tristan had both declared their love for each other. That is a story that as a dating, love, and relationship coach, I hear so often. Can love happen this quick? Or is that two people who really have no emotional stability and breed together decisions from that place. Thus, now a baby is born days after daddy Tristan is found cheating in a club being intimate with two random women while Khloe is in the hospital waiting to deliver her precious bundle of joy. Ladies, if you want your true forever then there is no rush. Take your time and get to know someone. An emotionally stable person knows that you can’t meet a guy/ girl and in 4-6 months know enough about them to honestly say that you both are in love. Time tells all there is to know about someone. If he is truly your forever, then I promise you taking your time will not lose him. Trust. And if it does, he was gonna he gone in the first dang place. For real. Trust and believe. On another note… I am a believer of the “change” that men and women can make after past mistakes and lessons learned. Tristan could have been a guy after the first situation with the other girlfriend before Khloe, he could have decided to make some different choices moving forward with Khloe by protecting himself from getting another woman pregnant with just having another baby so recently. He could have taken some time before dating again. But chile… real talk. What man would be able to slow down anything on a Kardashian train? His friends should have said GET OUT!!! Unfortunately, Tristan Thompson did not learn from his mistakes and keeps going with the toxic behavior from his relationship prior to Khloe Kardashian. Many of us can relate to the truth of trusting in the good that we see in a man, not believing that what he did in his past could ever be done to us because “he’s changed”. There are many women just like Khloe who desire to build a great relationship with a man, excusing his previous mistakes, with that same hope. No matter who you are, this was too low for even a Kardashian. Although many believe that Khloe deserved this backhand in love because of her decisions, we all deserve the love and relationship that we desire. We just have to balance our emotions better. Emotional instability leads to irrational decision making. Take your time getting to know someone. If you want your forever person, he/she will value the time you both take to get to know one another before jumping into a relationship together. Listen with your ears to what a person says. People tell you who they are. When they do, believe them. Listen with your eyes by paying attention to their actions. Actions speak even louder than words. When a person shows you who they are, believe them. Simply holding on to these 5 keys for the balancing of your own emotions significantly decreases the amount of fooly decisions that you could make in your relationships. Having even-ended emotions helps us not only be aware of the reality of our partner but also gives an advantage of dismissing anything that does not align with the standards that we have. Staying in control of emotions benefits us in the long run by causing us to never accept behavior or a version of love that is beneath us. Perhaps if Khloe Kardashian had known of these few, and held true to them, this whole scandal between her and Tristian could have possibly been avoided. Maybe not in totality, however, perhaps the need to rush the relationship between the two in such a short time span would have been alleviated. Regardless of what should have or could have happened for the both of them, I can only hope that Khloe learns and grows from this situation because she and other women alike deserve so much more in love. Try This and Attract The Love You Want! 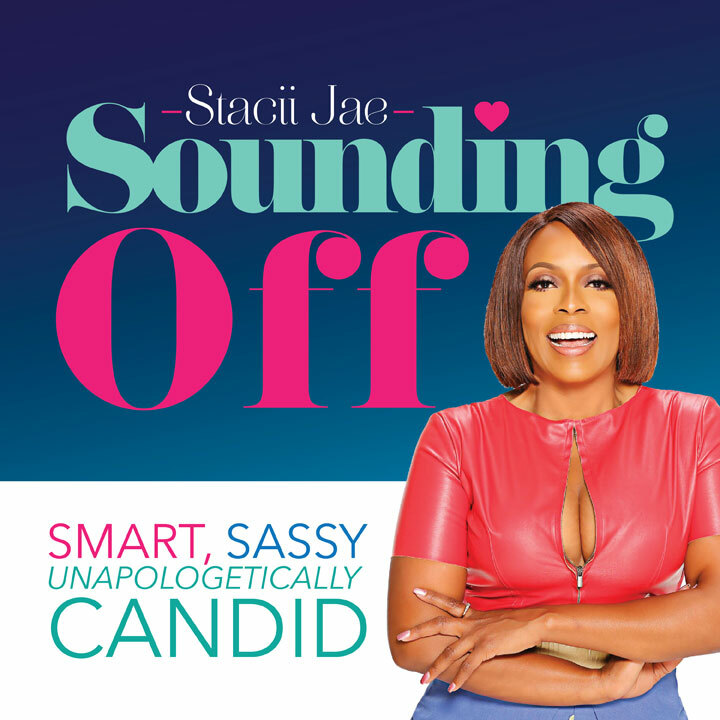 Stacii Jae Is Coming To A City Near You! 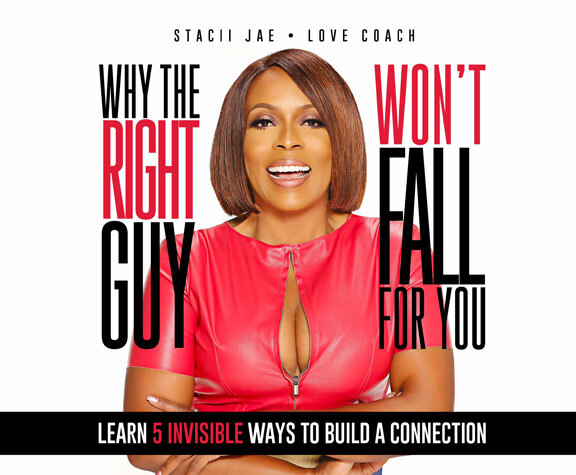 Copyright © 2019 Stacii Jae Johnson | Theme by SiteOrigin.